Mount Bromo Milky Way Camping, Blue Flame Ijen Crater Tour 3 Days is one of Mount Bromo tour 3 days 2 night, This Milky Way photography package is the most preferred by photographers to see the Milky Way at Mount Bromo. If you are intereted to enjoy this travel package, You must start from Surabaya in the morning around 11.00 - 12.00 PM, in order You have more time to relax at the camping place on Mt Bromo Peak while preparing to see the Milky Way at midnight time. For the visitors who arrive from Banyuwangi. We suggest you to choose Blue Flame Ijen Crater, Mt Bromo, Madakaripura Waterfall Trekking 3 Days finish Surabaya, Malang. Detail itinerary,You can read below. 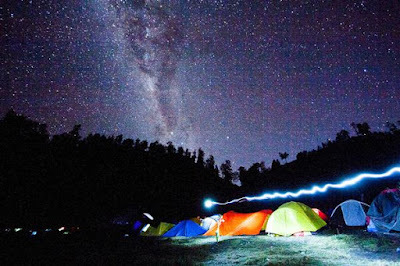 Mount Bromo Milky Way Camping, Ijen Crater 3 days starting from Surabaya, Malang at 11.00 - 12.00 pm, Our driver will pick you up from Surabaya Airport or Hotel then take your to the parking lot in Cemoro Lawang area for 3,5 hours driving. After you reach the parking lot in Cemoro Lawang, continue visit the highest peak by Jeep 4 WD to make a camp for 1 night stay in a tent including hot drinking for tea or coffee. Enjoy the Milky Way photography for twinkles until finish the Milky Way Photography by Camp at 04.30 AM (You can set your camera into suitable with the Milky Way capturing, In order You can get good picture for Milky Way). Finish enjoy Mount Bromo Milky Way photography, Continue take picture for Mount Bromo Sunrise appears at 05.20 AM and other views for Sea of Sand, Mt Batok, Semeru Volcano (the highest volcano in Java Island) until finish at 06.30 AM. Return to your Jeep and visit the Crater by stop at Sea of Sand then do trekking for 30 minutes or using horse transportation for 15 minutes. Finish enjoy the Milky Way, Sunrise, and Crater. Continue to Restaurant around Cemoro Lawang, have breakfast, take shower and Continue your trip to Hotel around Ijen Crater for 6 hours. Reach Hotel in Ijen area, Stay 1 Night. 23.00 AM, Wake you up for preparing, Start visit Paltuding (parking lot) for 2 hours using Car or Van. After get the top, enjoy the views from the Crater rim such as Green Acid Lake, Sulfur miners loading sulfur and massive Ijen Volcano rim until finish. (12.00 PM) Check out from hotel around Ijen area, Comeback to Surabaya or Malang for 7 hours, possible continue to Banyuwangi Harbor, then Finish Mount Bromo Camping, Ijen Crater Tour 3 Days. Before You begin the Milky Way tour by Camping at Mount Bromo and Blue Flame Ijen trekking package 3 Days 2 Night, Hope You prepare complete equipments such as jacket, gloves, hat, long pants, trekking shoes and trekking pole, Because these volcano condition has little bit steep route with temperature around 03 - 05 degree centigrade. For detail information about Mt Bromo tour package price, accommodation and other Milky Way photography package facility, You can visit Our Contact.